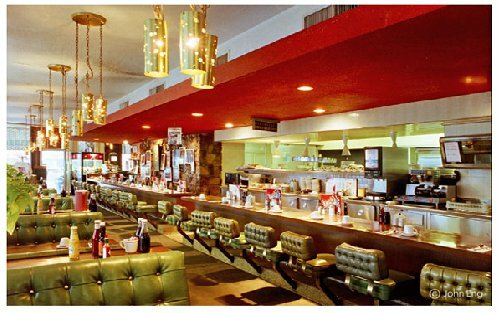 Bob's Big Boy Broiler, Downey, CA ~ Resurrected! DOWNEY, CA. Harvey’s Broiler was founded in 1958 by Harvey Ortner. He and his wife Minnie purchased the former poultry farm property located on Firestone Boulevard and Old River School Road in 1950 and hired architect Paul B. Clayton to design the restaurant. It was a superb example of Googie style architecture, also known as populuxe or Doo-Wop. This was a form of modern and/or futurist architecture, influenced by car culture and the Atomic Age. Googie originated in Southern California during the late 1940s and continued into the mid-1960s. The style lent itself well to motels, coffee houses and bowling alleys. Harvey’s epitomized the movement with a drive-in canopy in the shape of a boomerang and recessed lighting that beamed down like a UFO. The drive-in was somewhat of a fashion show as it could easily accommodate as many as 100 of the sexiest cars of its time. The flamboyant and famous signage was a landmark for the City of Downey, as it was strikingly visible to drivers and onlookers on the main drag of Firestone Boulevard. Harvey’s was renamed to Johnie’s Broiler in 1968. Johnie’s had one “n” instead of two because it was named after an interim owner with the last name Johnson. Johnson’s ownership was short lived. He did not meet the terms of the purchase agreement, and the restaurant reverted back to Harvey’s, but it was too late. The sign had already been changed from Harvey’s to Johnie’s. Christos Smyrniotis leased it from Harvey Ortner in 1970 according to city construction permits, eventually purchased it, and owned it through 2006. Johnie’s is considered one of the birthplaces of car culture in Southern California. It has been featured in magazines, commercials and movies. A scene from the biopic “What’s Love Got to Do with it” (1993) where Ike (Laurence Fishburne) and Tina (Angela Bassett) have a massive fight was filmed at Johnie’s. On New Year’s Eve 2001, Johnie’s closed its doors. In early 2002, the property was leased to a used car dealership, but the sign, structure, and drive-in canopy remained. Where cars were once displayed for pride, they were now displayed for cash. Fortunately, the dealer’s lease ended in August 2006. Unfortunately, a 99 year lease was signed with a new tenant, Ardas Yanik. Sunday, Jan. 7, 2007 was a tragic day. Horrified onlookers watched as bulldozers illegally chopped into and demolished the cherished landmark. Yanik reportedly did not get permits for the demolition, so there was no advance warning to save Johnie’s. The locals dialed 9-1-1, and the cops showed up in force. The demolition was stopped, but the damage was done. The main structure was heavily damaged, but the drive-in canopy remained, as well as the large neon sign, which became a symbol of hope and inspiration for a rebirth. Shocked supporters re-grouped and the Mod-Com (Adriene Biondo=Chair), Friends of Johnie’s (Analisa Ridenour=President) and Coalition to Save & Rebuild Harvey’s Broiler (Kevin Preciado=Lead) sprang into action. They attended hearings, city council meetings and got the word out that Johnie’s needed Downey’s help. 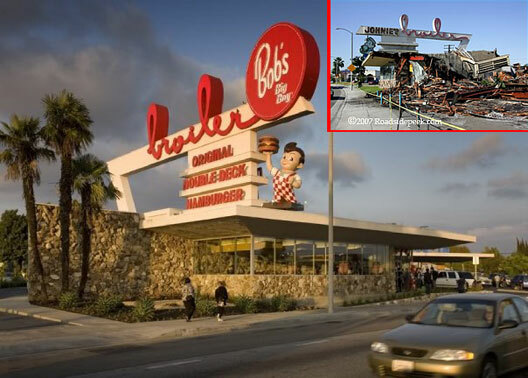 Because of their devotion to preserve Downey’s history, complete demolition was held off until Bob’s Big Boy came to the rescue. Downey came together as a family to rebuild Johnie’s in all its former glory. Today, it is a work of art. Take a look at the before and after photos. You will see that the renovation was true to its historic roots. Please visit their website at http://www.bobsbigboybroiler.com/. The best thing you can do to support its continued operation is to stop in for a burger or a shake really soon! For more on the history, see Johnie’s Broiler on Wikipedia. To see our prior blog post on The Broiler, click here. 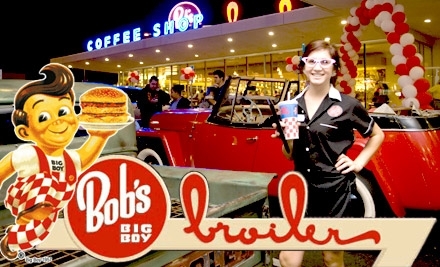 This entry was posted in Architecture, california, Historic Preservation and tagged Bob's Big Boy Broiler, CA, Downey, Googie Style, Harvey's Broiler, Johnie's Broiler. Bookmark the permalink. My dad ernest davis ran the clock in lynwood and harveys in downey for harvey ortner. He was head chef, ordered all the meat , vegtables , poltry ,hired ,fired , wrote all the menues and was responcible for the operation of both resturants.he thought the world of mister ortner. He spent many night playing poker at our house. Harveys at the time 1965 was the largest drive in , in the world. As a young boy i will never forget eating a chubby burger in the kitchen of this great eatery , ill never forget it. Worked there in 1966 and 1967. Great place!!!! To bad Bob’s big boy burgers are not the same as I remember not good at all . I took a good friend there from anouther country. And to my disappointment, the burger was not good cold, and dry very thin patties like you would buy in the market I was very imbarrest after me telling him he has not had a good burger until a Bob’s big boy. Very sad 😦 :-(.